Blickling Lake is a coarse fishing venue set in the grounds of Blickling Hall, owned by the National Trust. This open water of over 20 acres is shallow and weedy at the hall end. Depths vary from 6ft to 10ft at dam wall end. 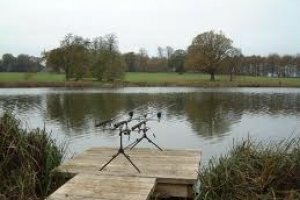 This is a mixed fishery stocked with Bream, Roach, Tench and Carp to Double Figures. Blickling Lake 6 out of 10 based on 1 ratings. 1 user reviews. Fished here last week 30/09/18 sadly drew a blank plenty of activity from jack pike chasing small fish in the margins ended up being broken up twice. This season blickling lake has not fished well according to those that I have spoken to lets hope for an improvement. The new fishing platforms are better than the old wooden ones.Shown in the picture above is an example of the original wooden type.Sadly the numbers of fishermen has dropped dramatically since the introduction of the 5.00 fisherman's car parking charge and then with the day ticket charge it makes for an expensive days fishing especially for OAP'S.Some sign of otter predation another adult carp was found dead recently with the usual tell tale signs, cormorants have been seen in the area.